On the other hand, Kamal Haasan has started prepping up for his role in Indian 2 and a trainer from the US has been flown specially to train him. 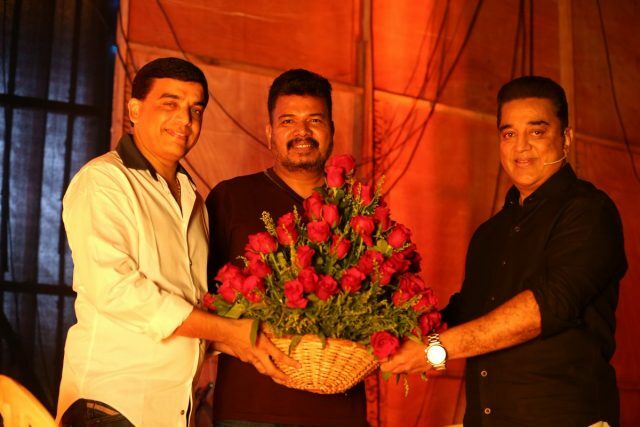 Ulaganayagan Kamal Haasan and director Shankar will team up after more than two decades for sequel of Indian which was announced recently by the duo on the Bigg Boss Tamil show. The film will go on floors in 2018 after Shankar’s 2.0 releases and Kamal Haasan completes all his prior commitments. Indian 2 will be produced by popular Tollywood producer Dil Raju and will be shot simultaneously in Tamil and Telugu, later be dubbed in to Hindi. Rumours started surfacing that ‘Indian 2’ will not be produced by Dil Raju and he has backed out of the project due to reasons unknown. But the production house clarifies that Dil Raju will be producing ‘Indian 2’ and has not backed out. “Dil Raju is producing the film and he is the solo producer. We cannot comment upon other production houses,” a source told us when contacted about this. It was being reported that Lyca Productions has taken over Indian 2 and will produce the film now. With clarification coming in from the production house of Dil Raju, it is clear that news of the producer backing out are rumours. On the other hand, Kamal Haasan has started prepping up for his role in Indian 2 and a trainer from the US has been flown in to train him and get him in shape for the role. The actor is taking special care for his role and it is being said that he will sport a bulky look in the film, which is the most talked about film in South Indian film circles.